Fall means less sunshine, vacations, and more time spent indoors. It also means your kids back in school and more dirt, sweat, and leaves are tracked indoors! Maid services in Colorado Springs offer you more time to spend doing what you love this fall so you can worry less about cleaning. 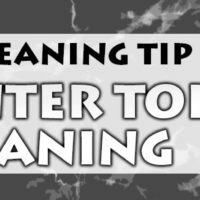 To keep your home and possessions tidy this fall between regular cleanings, consider the following fall cleaning tips for your house. Place a doormat at each door and ask family members and guests to remove their shoes before entering. This simple tip keeps dirt, dust, water, and debris from tracking into your home during a busy, fun-filled fall. Your carpet, tile, or hardwood floors will stay clean longer and you’ll spend less time sweeping or vacuuming the dirt off your floors. When you have guests over or enjoy time with your family, give yourself a break from dishes and use paper plates instead. Using your dishwasher less will keep your home cooler and you’ll enjoy a clean sink without piles of dishes. Sit back and enjoy your evening meal on plates you can recycle or toss. When it heats up in the home during the fall, trash cans tend to become smelly fast when trash is exposed to high temperatures. Clean and disinfect your trash cans for a fresh start. Change out your trash often or buy scented trash can liners to keep your house smelling fresh. Now that you’re using your patio and sliding glass doors more often, it’s time to clean the tracks and keep the doors in great working condition. Spray an all-purpose degreasing cleaner on the tracks and wrap a rag around a screwdriver. Make several swipes to wipe out the gunk. This will keep your doors opening and closing smoothly all fall long. Leave the shower door or curtain open after you shower to allow the walls to dry. This prevents molds and mildew which means you’ll spend less time scrubbing the shower. Use a shower spray as an added deterrent to keep molds and mildew at bay. Stay warm and have fun this fall while taking simple precautions to keep your home fresh and clean. Maid to Shine offers professional maid services in Colorado Springs to do the scrubbing and dirty work for you. Schedule an appointment to deep clean your home or request ongoing maintenance cleaning. You’ll have more time to enjoy summer by taking advantage of maintenance maid services in Colorado Springs. How Do You Find the Best House Cleaning Service? All of these 5 cleaning tips everyone should know. I think it will improve the people cleaning sense significantly. Thanks for a nice share.